efenim daha once surada soZunu vermis oldugum uZere, sepetlerden bahsedecegim bu sefer.. bir onceki postta gormus oldugunuZ sepetleri tig ile yapmistim. 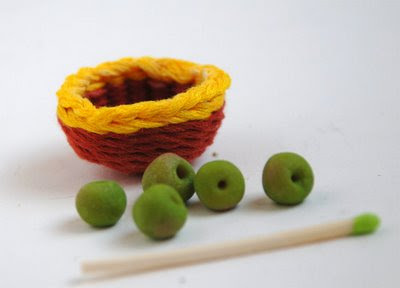 acikcasi anlatmak da istemistim nasil yaptigimi lakin dunyanin en uyduruk tig isi anlatimi olacak diye vaZgectim.. Zira turkce tig terimi olarak tek bildigim Zincir..
after promising that I'd talk about miniature basket making in an old post, here i am.. talking about miniature baskets.. well, the ones in the previous post were crocheted and even though i wanted so badly to explain how to make them, i decided not to. because it'd be the crappiest tutorial ever, since i really don't have a clue about crochet terminalogy. velhasil, sepetlerimiZe geri donelim. minyatur sepet yapimini ilk olarak suradan ogrenmistim. sonrasinda da farkli ipler, farkli tekniklerle deneye yanila iste bunlar cikti ortaya..
anyway, back to woven baskets.. i learned how to weave a miniature basket here. and then experimenting with different threads and different techniques, i got these..
su alttaki mesela boyle kalin ve sert, kagit rafya gibi bir malZeme.. kapagi da ayni ipin tigla orulmus hali. 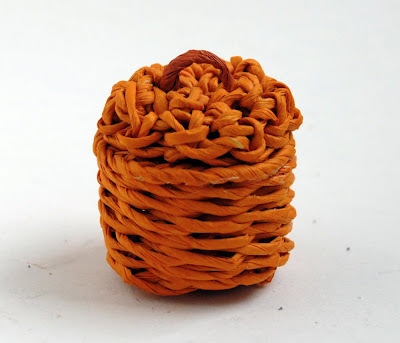 for example the one you can see below is made of some thick, paper raffia kinda thread. the lid is crocheted. 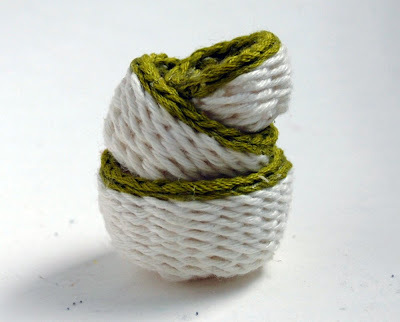 su alttaki ise tamamen nakis ipinden..
and the one below is compeletely made of embodiery thread. yuksek ihtimal beyaZ modurit (yahut beyaZ fimo ama cok anlamli olmaZ o Zaman) ile renkli meyve-sebZe yapimindan bahsedecegim bir baska yaZida gorusmek uZere efenim, esen kalin..
ha tabi, bunlarini bulabileceginiZ dukkana yonlendirmeden olmaZ, buyrun.. 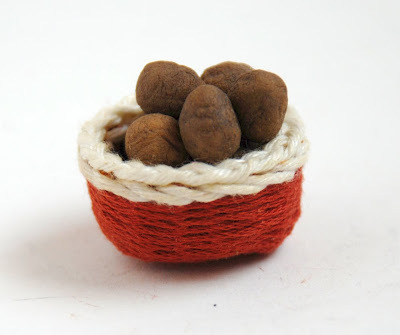 I wish you all a nice day until the next post which, highly possibly, will be about making miniature fruits and vegetables with white modurit (or fimo, or even sculpey for that matter)..
oh and of course, the shop addess where you can find these..